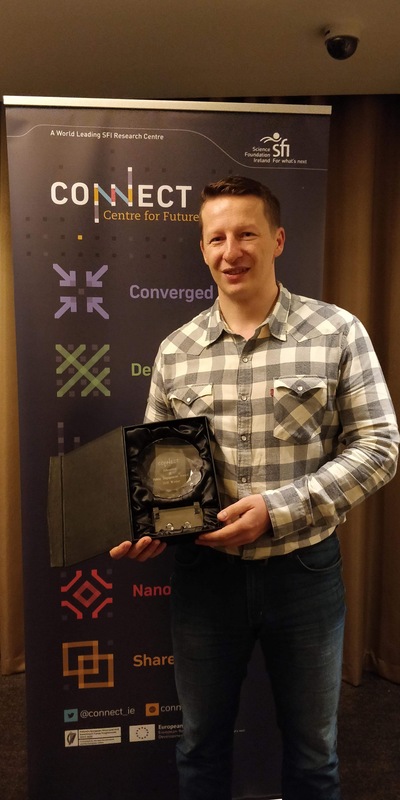 CONNECT has recognised the achievements of several researchers at the Centre’s inaugural awards ceremony held during the annual plenary assembly in Kilkenny. Adam is a postdoctoral researcher in the School of Electrical & Electronic Engineering at DIT, received the award for ground-breaking work on full-duplex radios, which could lead to more secure wireless communications. “A full-duplex radio doubles the communication speed of a wireless device,” Adam explains. “The device can transmit and receive signals simultaneously – a feature currently not implemented in any commercial product. Its benefits are so great that this research area is sometimes called the holy grail of telecommunications. “My focus is on the design of the antennas used in these radios. The antenna’s performance is vitally important for the operation of the radio. A perfect full-duplex antenna is capable of transmitting and receiving simultaneously, but cannot be more than 50% energy efficient. We have been trying to achieve as close to 50% as possible.” Congratulating Dr Narbudowicz, Prof. Max Ammann said: “This is a well-deserved recognition of Dr Narbudowicz’s ability to combine basic theoretical research with commercially-oriented investigation. This is his third award in under a year, having already won prizes at the International Symposium on Antennas and Propagation (ISAP) in Thailand, and just recently during the IEEE-EURASIP Summer School on Signal Processing in Italy. His research on the fundamental efficiency limits of antennas for full duplex radio has been accepted for publication in IEEE Wireless Communications Magazine. This is a top-tier telecommunications journal with an impact factor of 9.2, and an indicator of the quality of his research.” Adam is also researching ways of improving security for Internet of Things devices, which are becoming increasingly common in homes and work places and is leading a project on radar to accurately detect drones. The work, conducted at Prof. Ammann’s Antenna and High Frequency Research Centre, has already won funding from Enterprise Ireland, and has been supported by the NDRC pre-commercialisation boot camp. 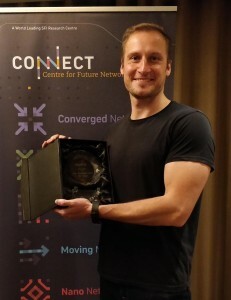 The award is named in memory of the late Prof. Tom Brazil who was a Principal Investigator at CONNECT until his untimely death earlier this year. Adam is also an EDGE research fellow. EDGE is a Marie Skłodowska-Curie COFUND Action offering prestigious fellowships for experienced researchers moving to Ireland. He has also held an IRC Elevate Fellowship. He also collaborates with Prof. Nicola Marchetti’s complex systems research group in Trinity College Dublin. Andrew, an Assistant Professor at the School of Computer Science in UCD, received the award in recognition of a technique, developed with Google, which is now used to assess the audio quality of YouTube’s most popular videos. “This area of research is called ‘Quality of Experience and it is key pillar in CONNECT’s research platform,’” Andrew explains. “The research leading to this development was conducted during my time in UCD, DIT, and Trinity College Dublin. “Our work has also been used in the development of the OPUS codec which is used to stream over 1 billion minutes of audio per week through the Chrome browser. 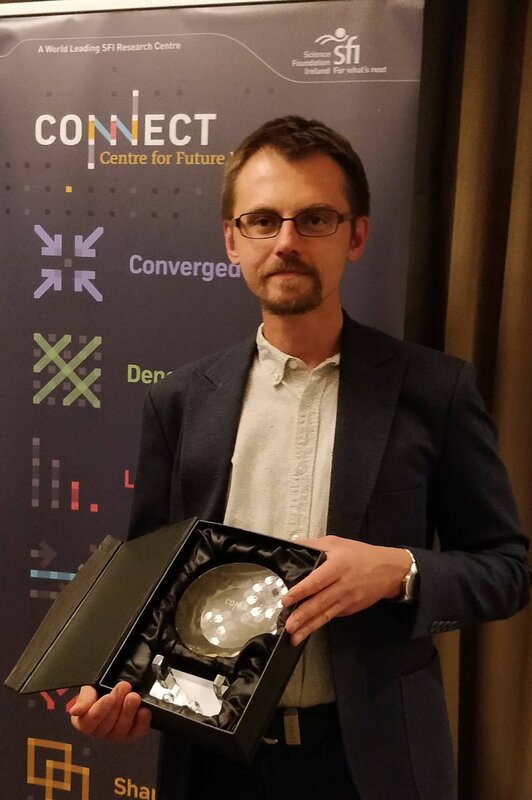 The model has been freely shared and is used for research and development across other industry leaders such as Microsoft and Apple.” In May, Dr Hines was awarded the 2018 American Chamber of Commerce/Royal Irish Academy Research Innovation Award in the HEI category in recognition of his research in this area. Later this year, a production-quality release of the ViSQOL audio quality platform, which has emerged from his research, will be released through Google-branded channels as a royalty-free, open-source product.